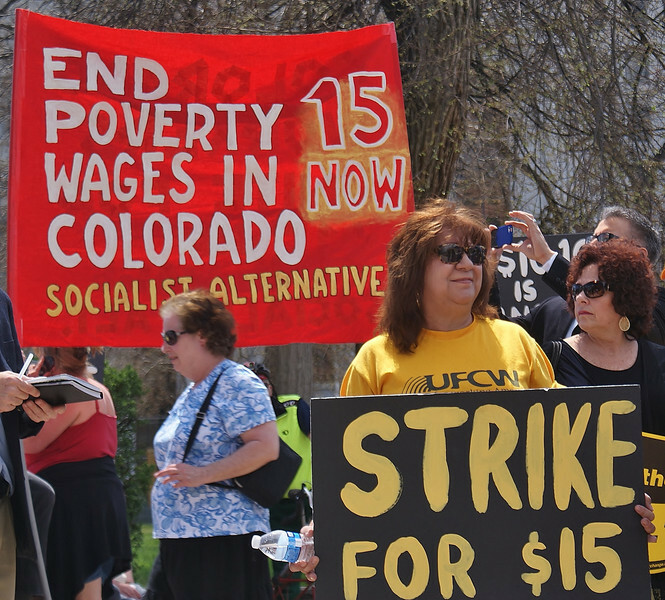 Unions members and other protesters rallied for an increase in the minimum wage, in Denver Colorado, 4/23/14. 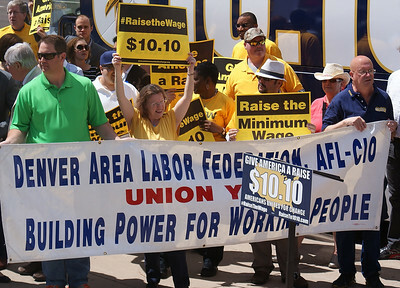 Two men at rally hold signs supporting raising the minimum wage, one wearing Newspaper Guild t-shirt, other demonstrators with signs behind them. 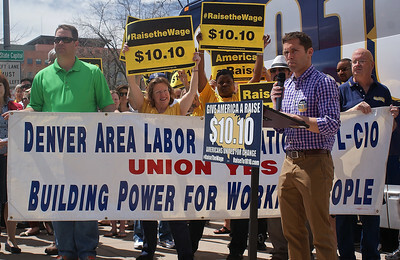 Members of Denver Area Labor Federation hold banner at rally for increasing the minimum wage. 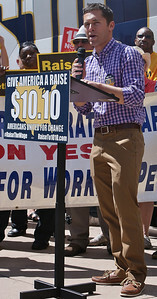 Man speaking at podium at minimum wage rally, "$10.10" sign in front of him. Members of Denver Area Labor Federation hold banner at rally for increasing the minimum wage, man speaking at podium in front of them. 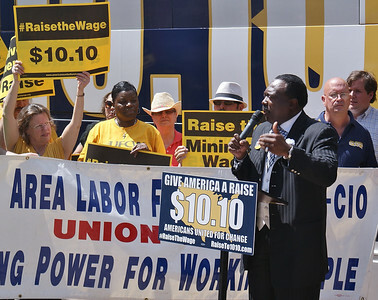 African-American man gestures while speaking from podium, people with sign calling for increase in minimum wage behind him. 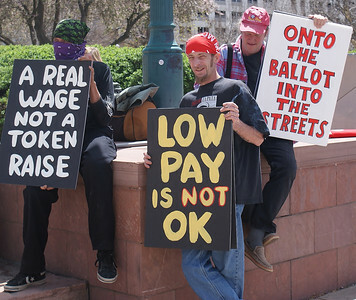 Three men holding signs objecting to low wages. 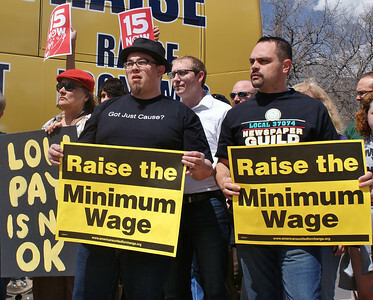 Union member, wearing Newspaper Guild shirt holding "Raise The Minimum Wage" sign. African-American man holding "Give America A Raise" sign. 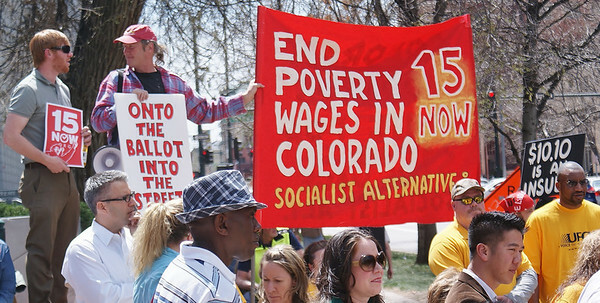 "Socialist Alternative" members hold large banner against poverty wages, 3 people talking in front of them. Woman holding "strike for $15" sign" at minimum wage protest, large banner about poverty wages behind her. 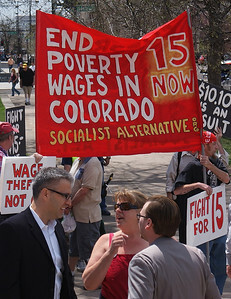 Demonstrators hold large banner opposing poverty wages, other protesters around them.